The term “quadriplegia” refers to a loss of functioning both arms and legs. This is commonly caused by spinal cord injuries, but in some cases may also be related to head injuries. Unfortunately, victims of SUV rollover accidents may develop this condition as a result of their injuries. If you or a loved one suffers from quadriplegia as the result of an SUV rollover accident, you may be entitled to financial compensation. 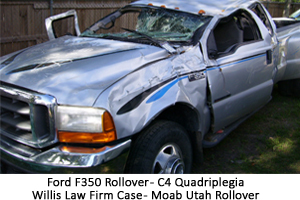 Contact the SUV rollover quadriplegia lawyers of the Willis Law Firm by calling 800-883-9858. Spinal cord damage can affect both the sensation and functioning of the arms and legs. If a patient experiences complete loss of both sensation and functioning, this is known as a complete injury. If a patient experiences loss of only sensation or functioning, or partial loss of both, this is known as an incomplete injury. Respiratory difficulties – Damage to the spinal cord along the neck can interrupt the signals between the brain and the rest of the body. In addition to paralysis of the arms and legs, this can cause suppression of the respiratory system. Some quadriplegic people need machines to help them breathe. Loss of bowel and bladder control – Damage at any point of the spine between the hips and neck can affect the brain’s ability to communicate with internal organs. This can cause the patient to temporarily or permanently lose control of his or her bowels and bladder. Blood clots – Lack of mobility of the body slows blood circulation. This can lead to the formation of blood clots, which can travel through the bloodstream and potentially block veins. This blockage can lead to brain injuries and death. An injury that leads to quadriplegia can dramatically alter a person’s life. We believe that no one should have to suffer unduly because of someone else’s negligence. That is why our SUV rollover quadriplegia lawyers work hard to help our clients seek justice. The SUV rollover quadriplegia attorneys of the Willis Law Firm are ready to fight for you. Contact us today by calling 800-883-9858.